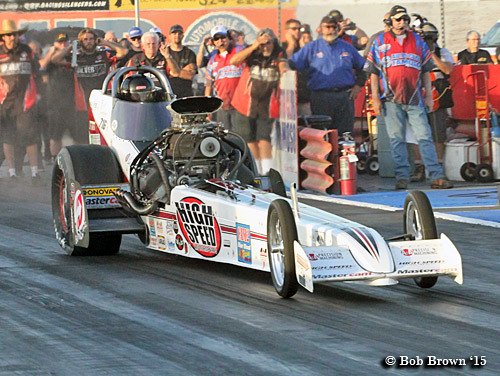 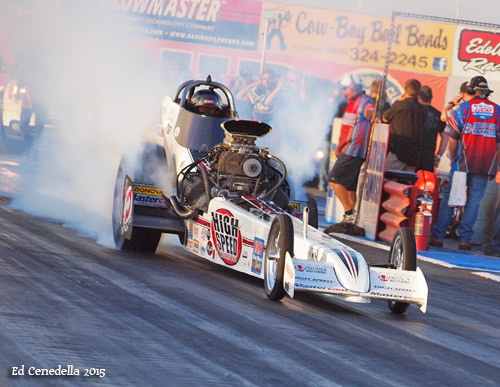 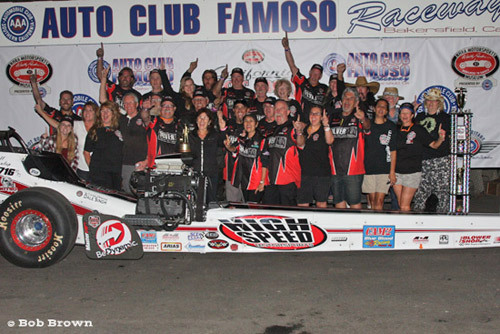 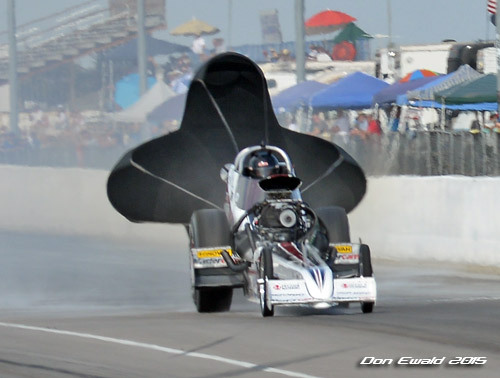 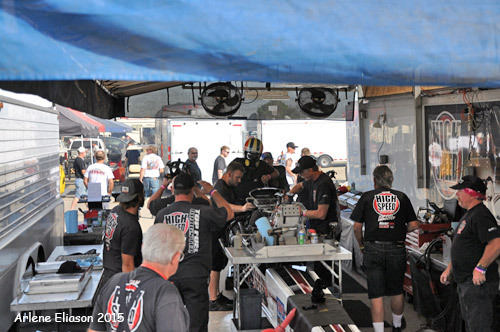 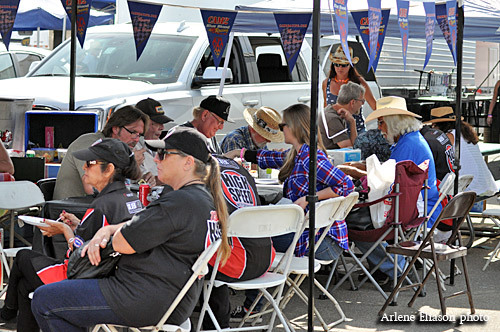 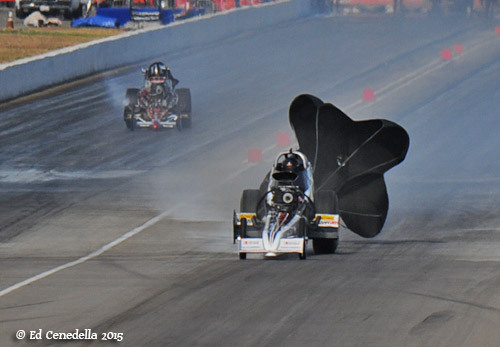 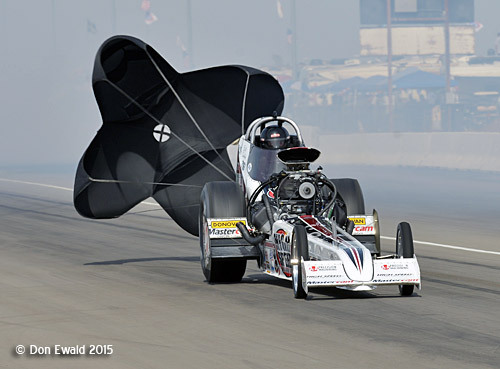 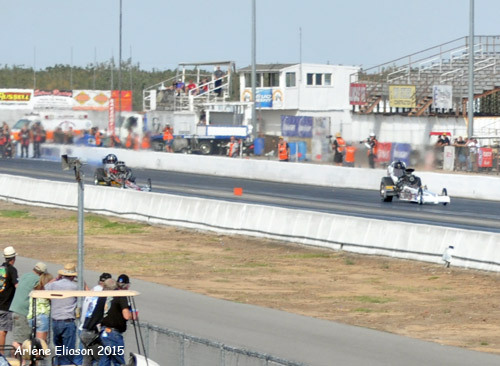 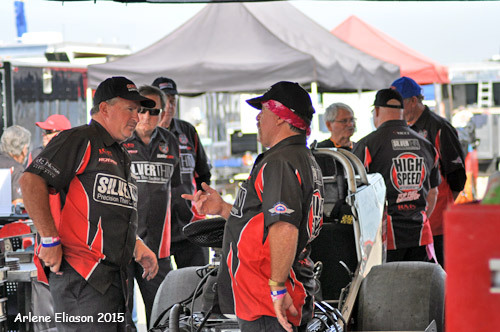 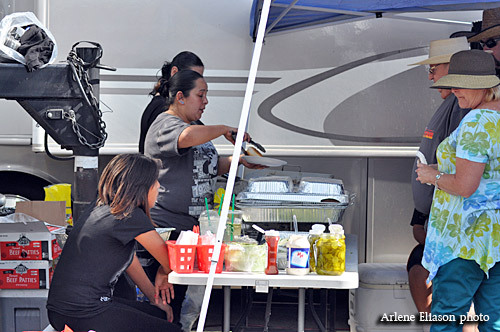 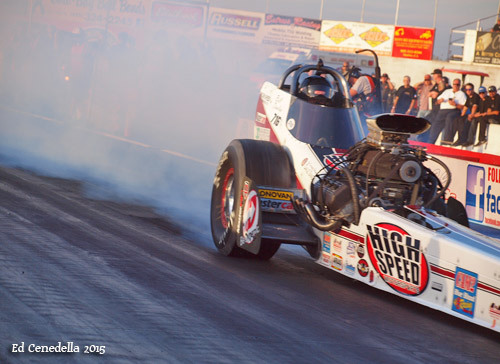 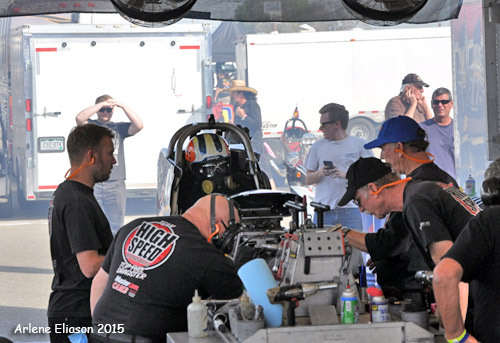 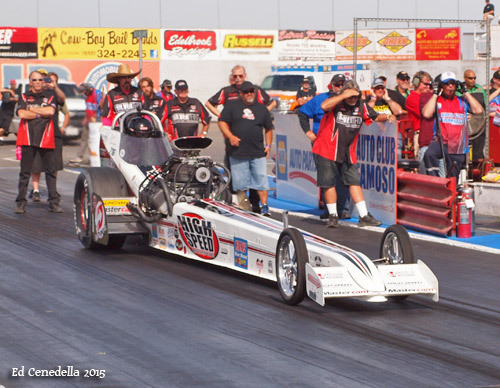 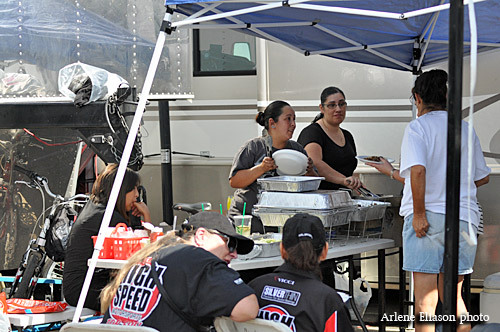 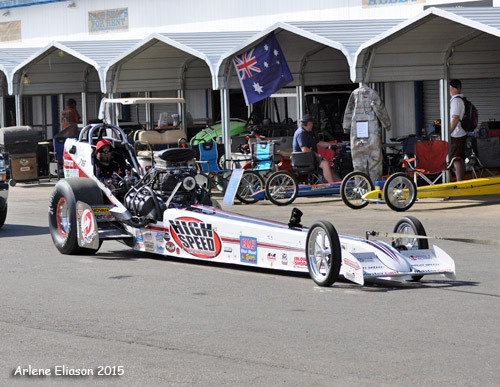 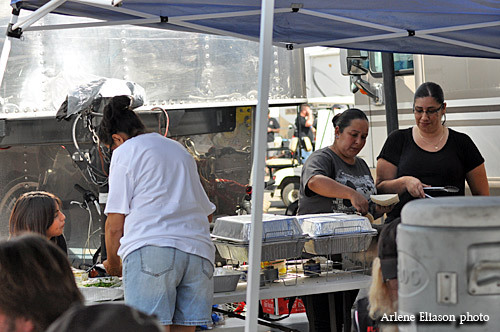 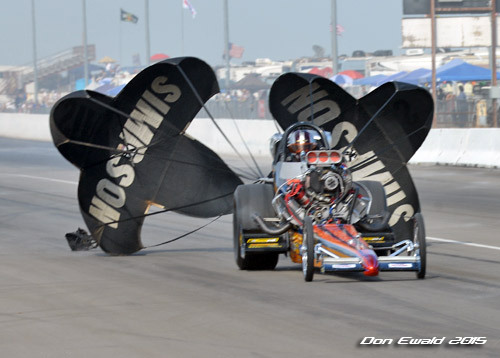 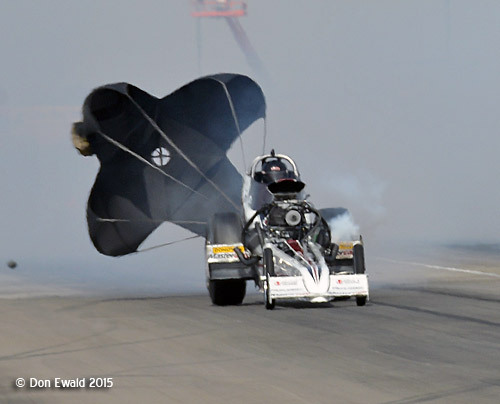 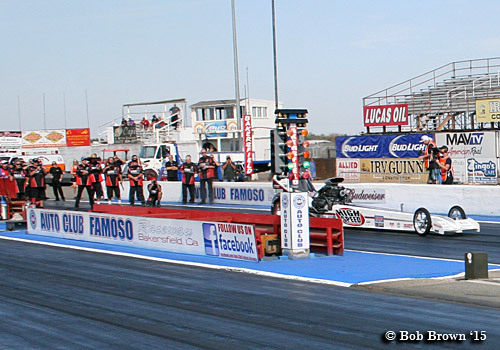 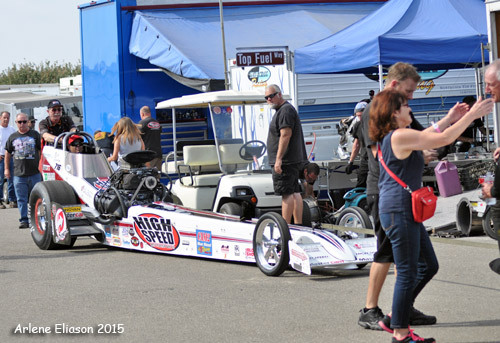 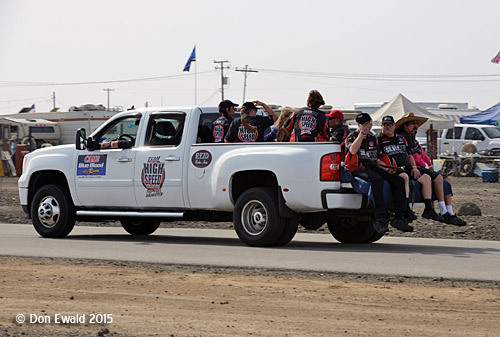 It was a great weekend for the High Speed Motorsports team (to say the least). 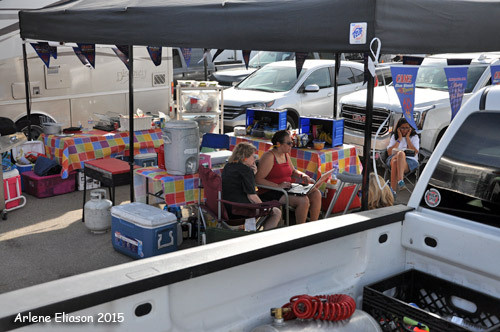 Graced with 4 days of Chamber of Commerce weather, at the end of the day there was the second "Wally" of the year sitting in the trailer. 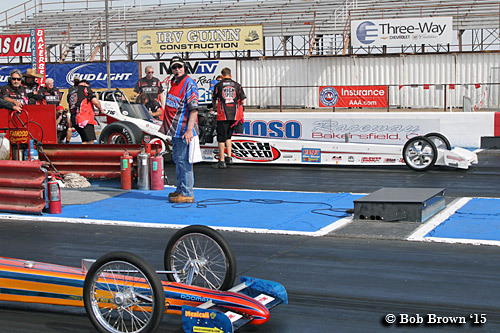 Dunlap won the National Hot Rod Reunion in Bowling Green, KY back in June. 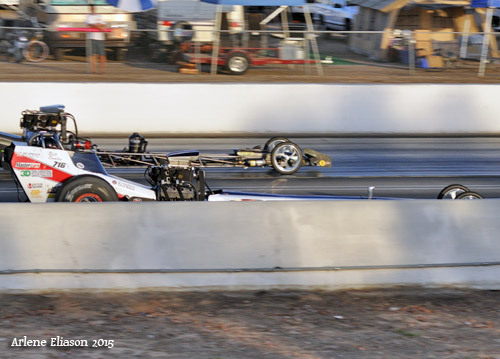 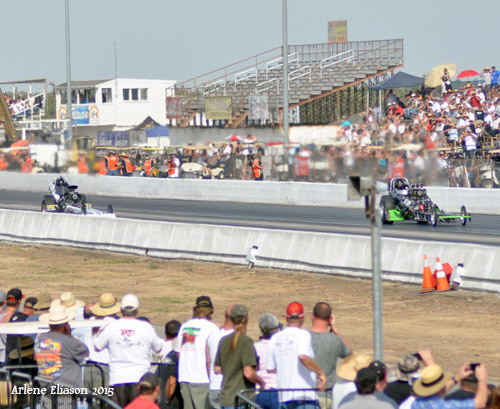 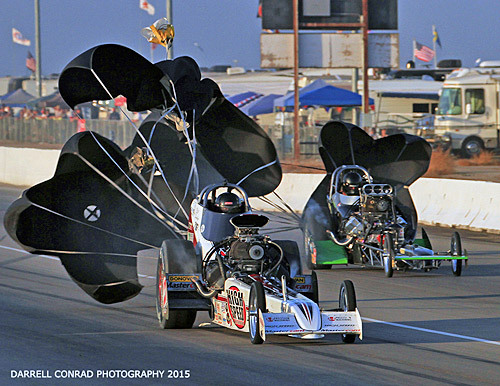 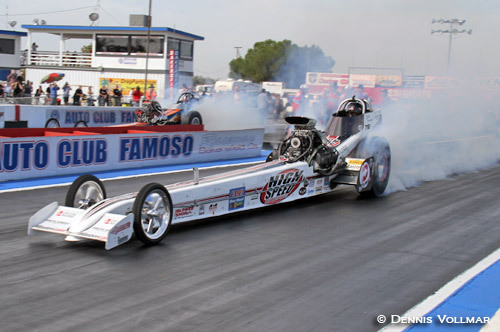 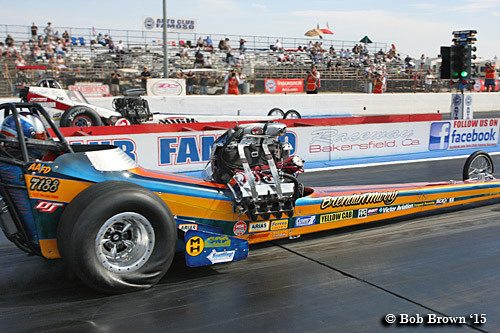 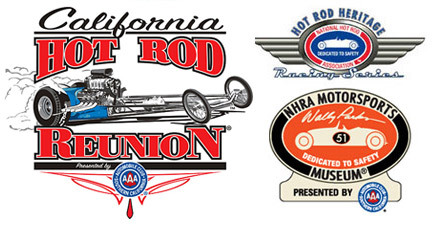 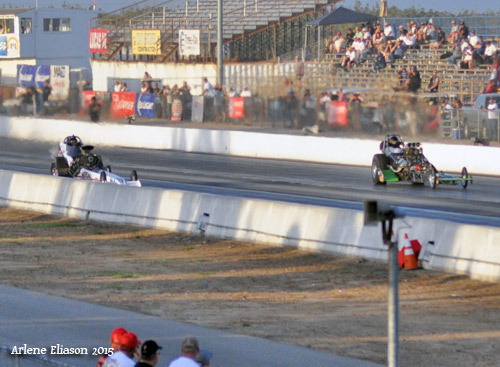 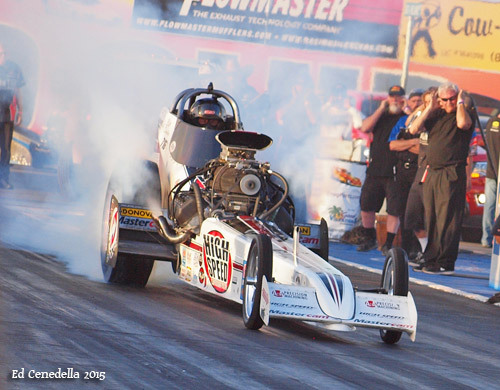 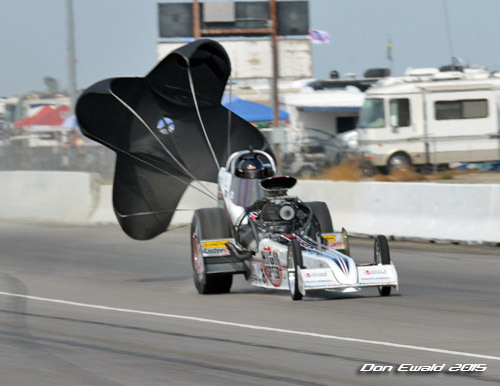 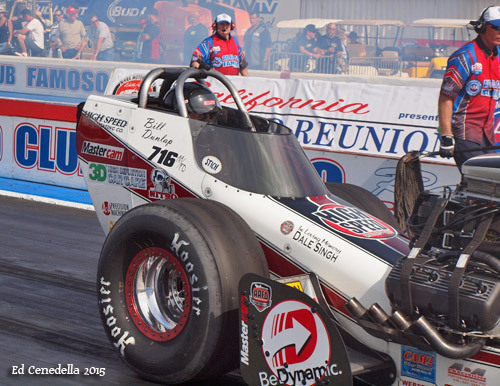 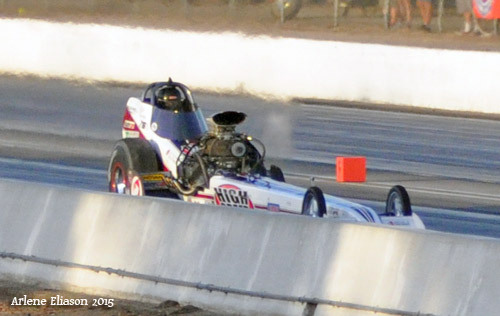 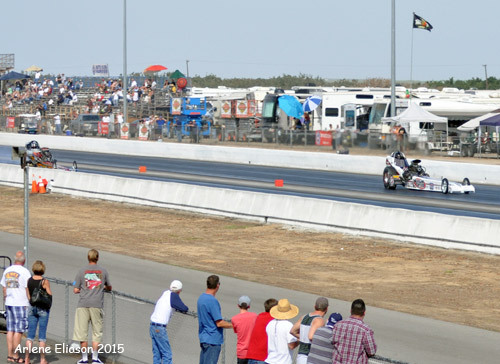 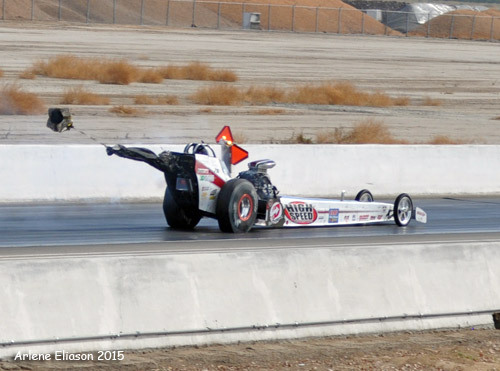 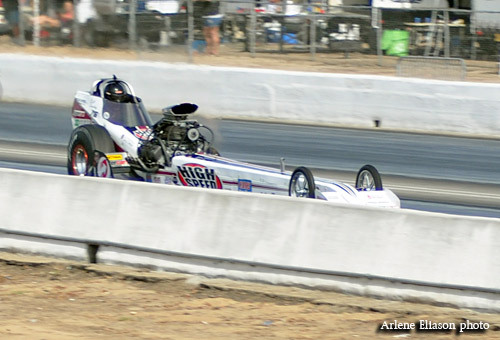 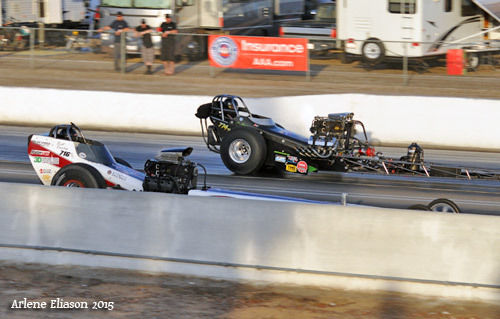 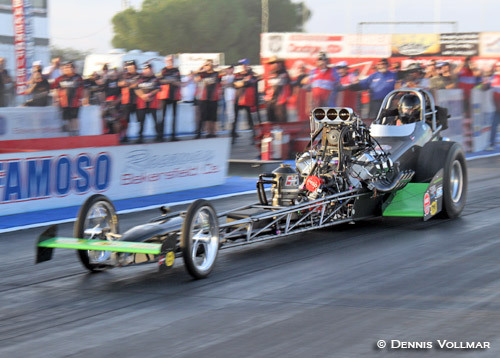 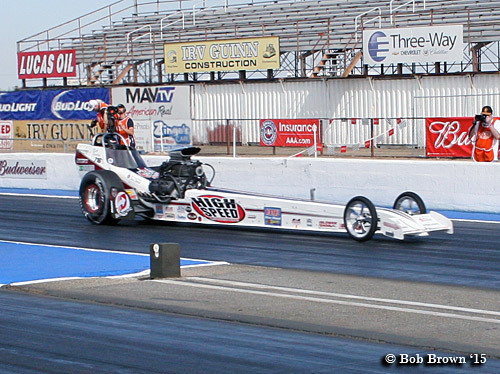 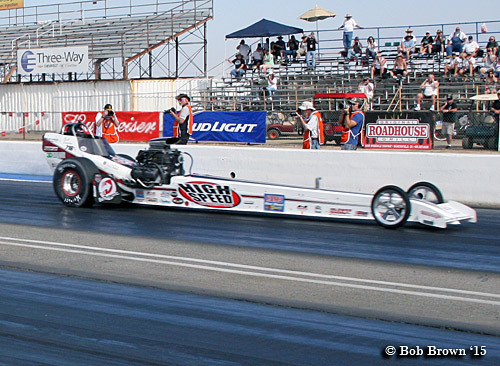 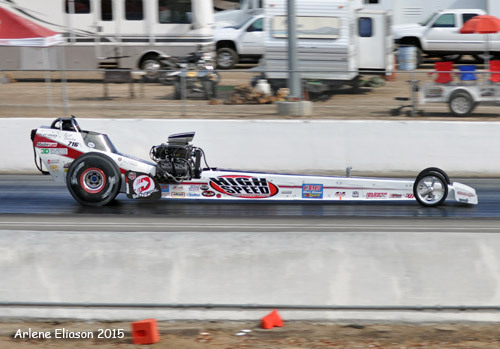 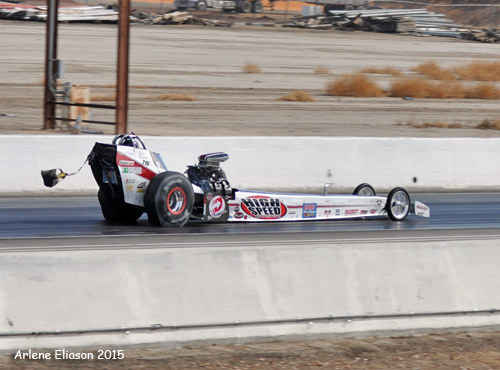 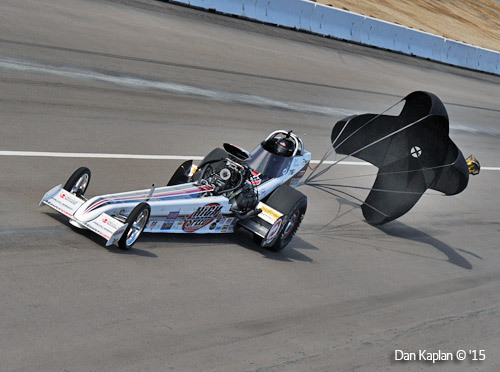 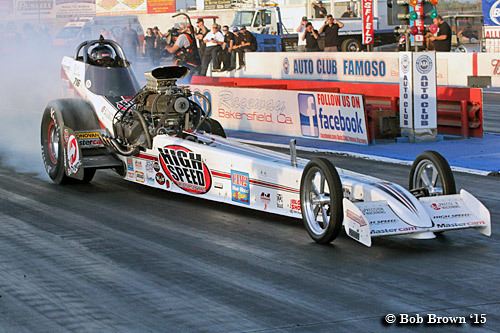 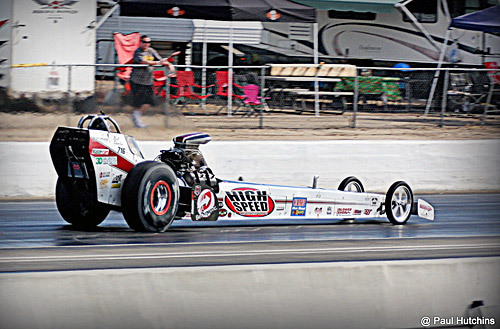 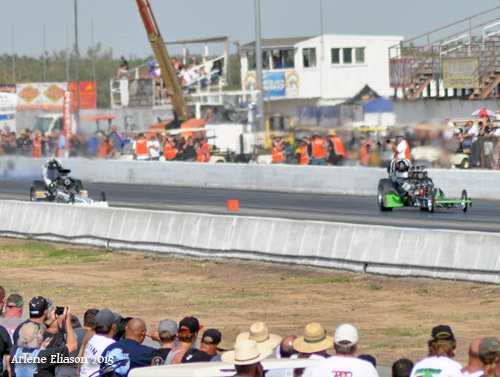 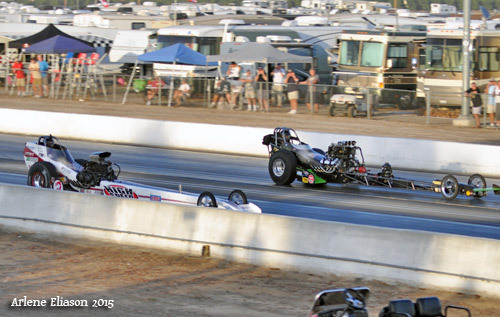 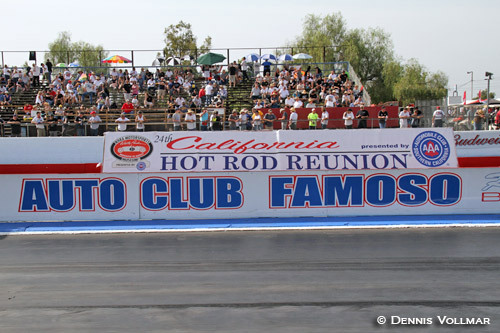 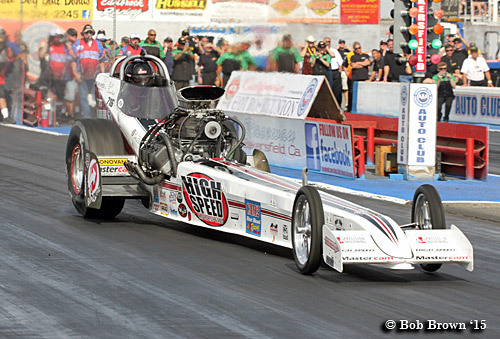 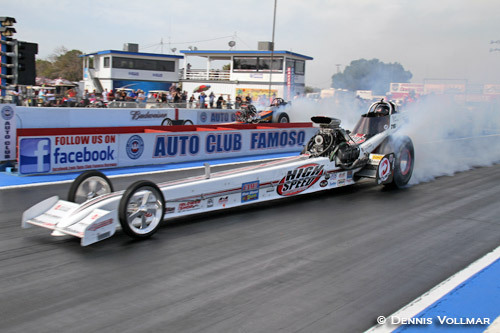 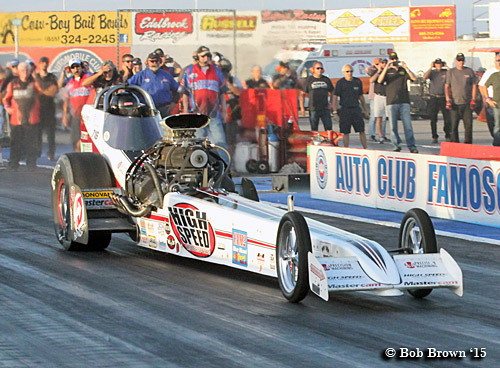 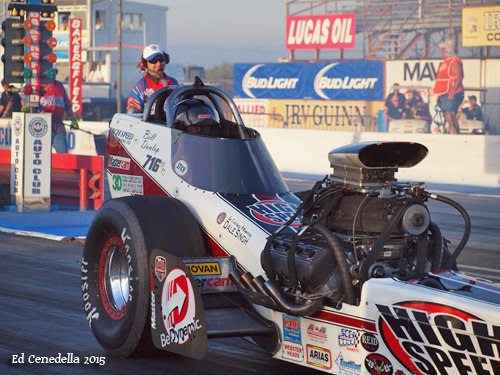 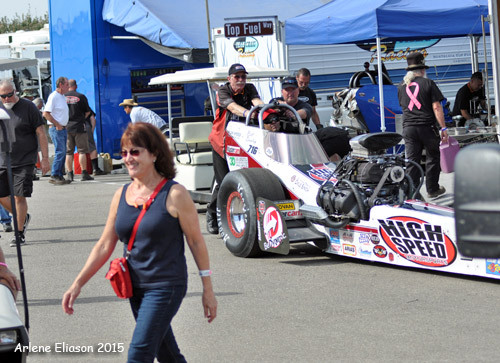 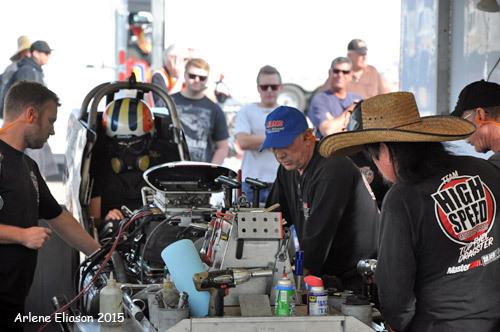 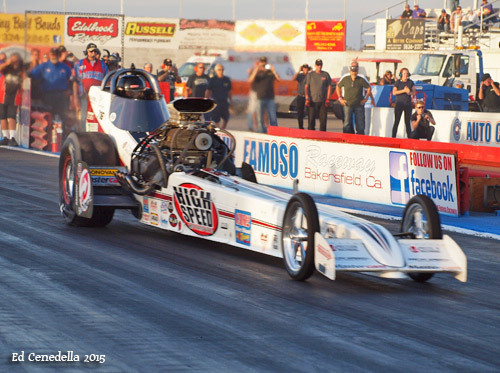 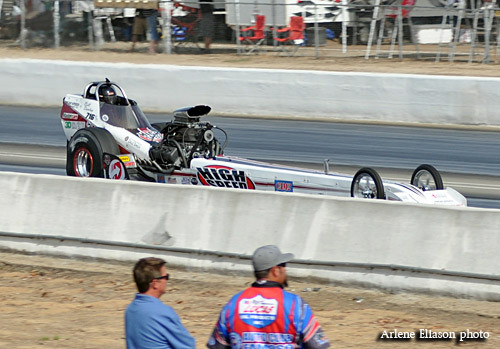 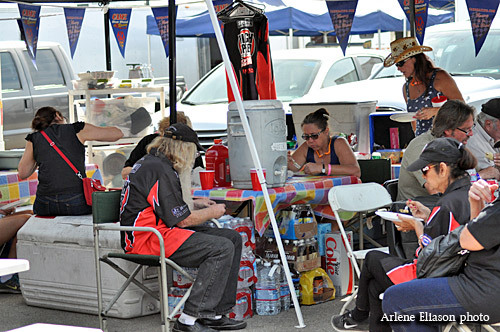 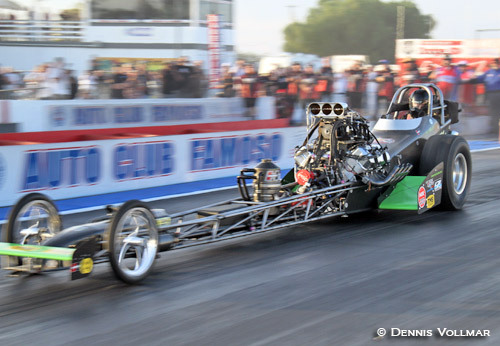 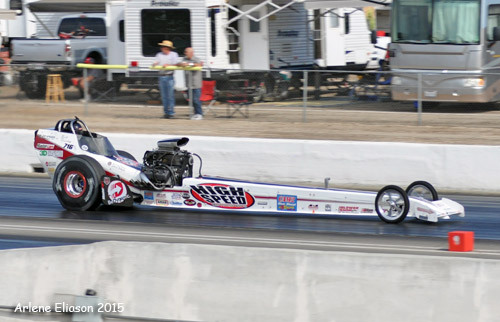 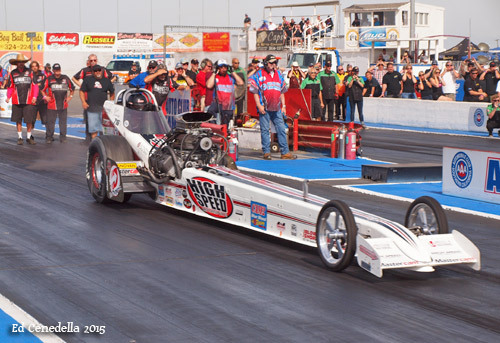 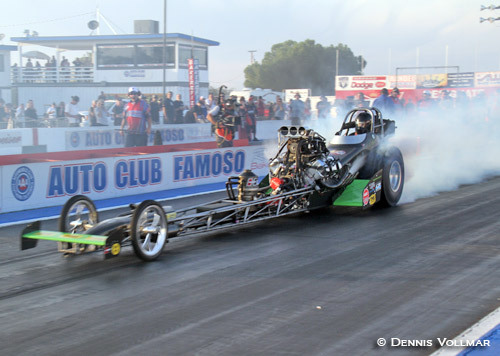 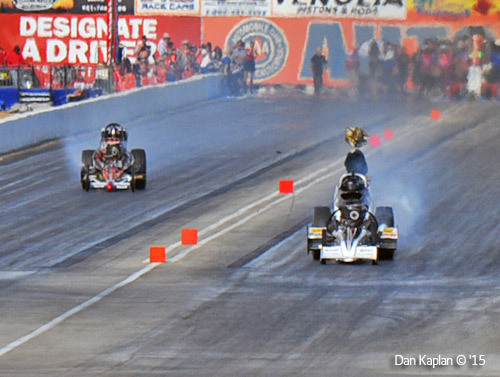 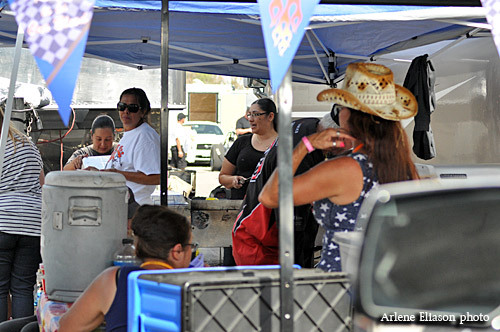 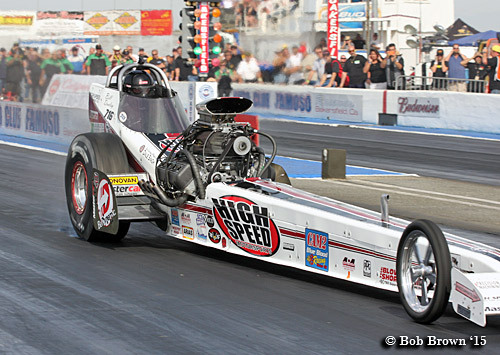 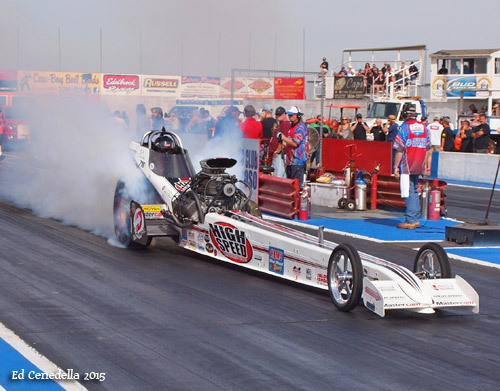 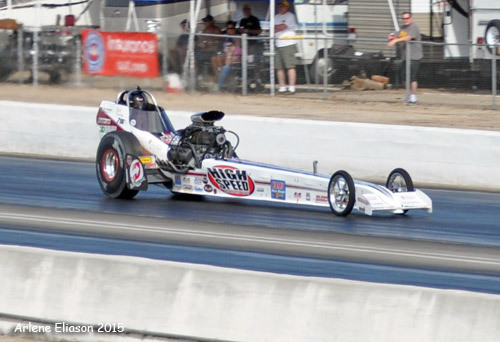 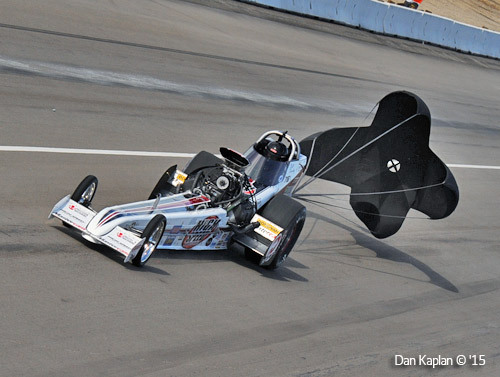 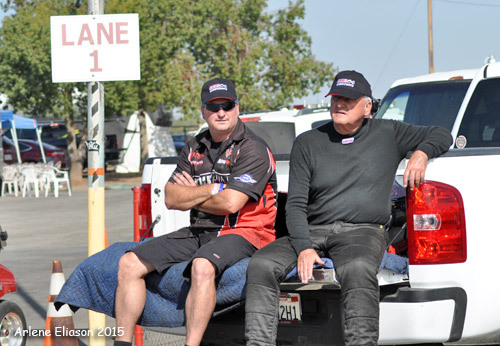 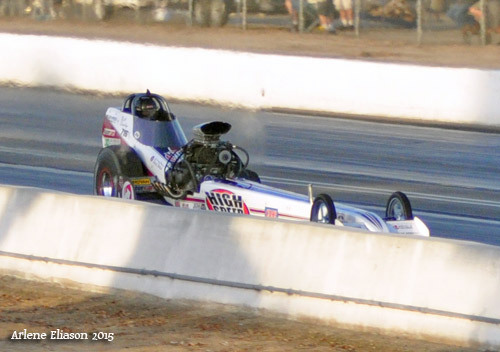 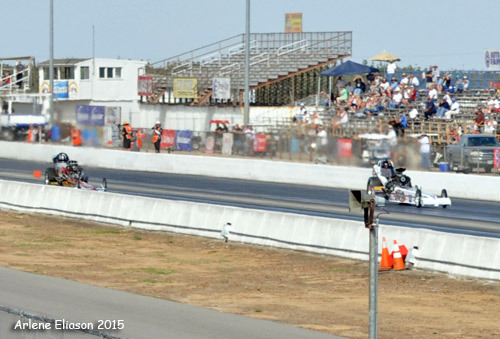 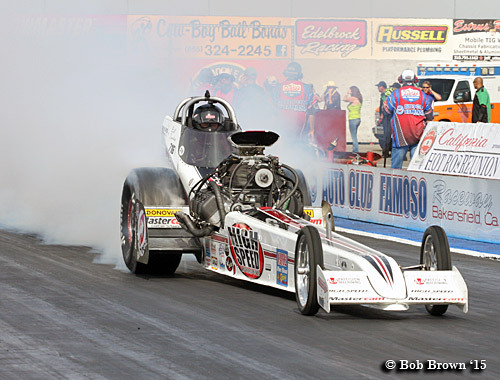 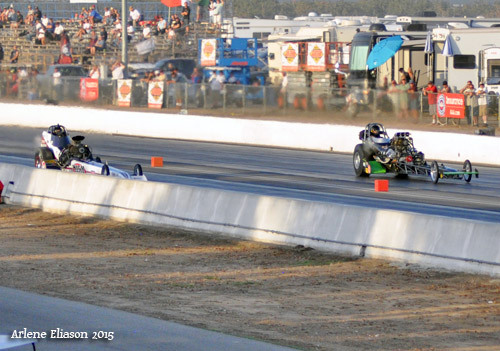 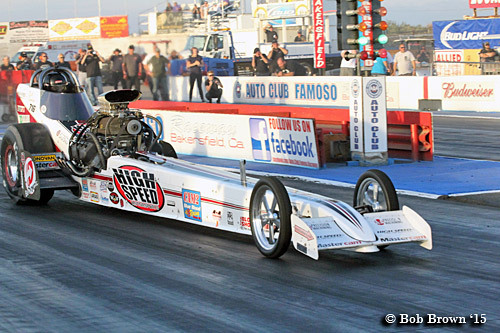 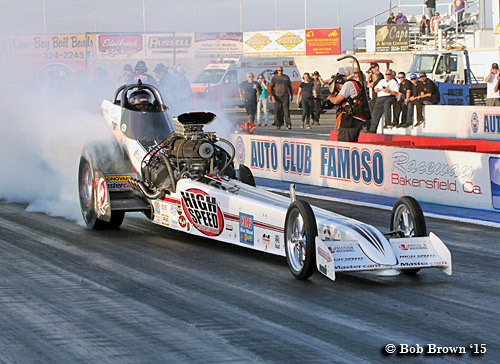 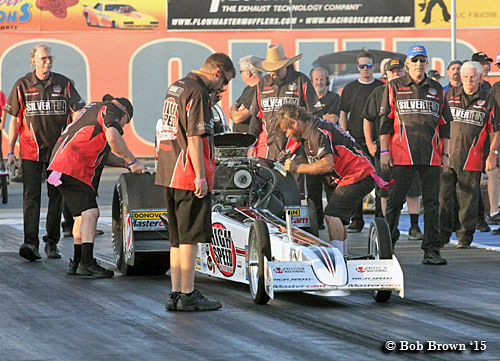 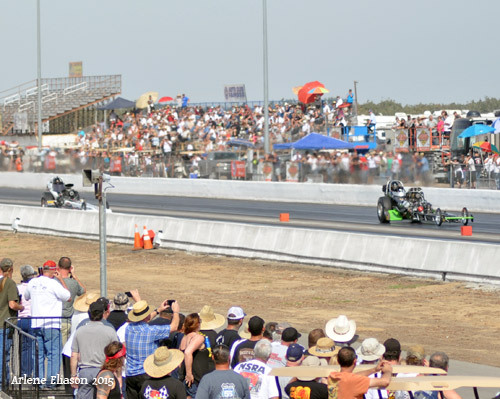 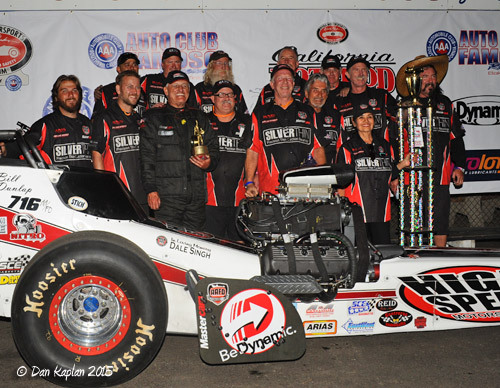 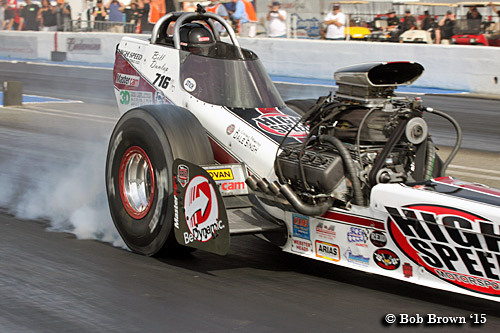 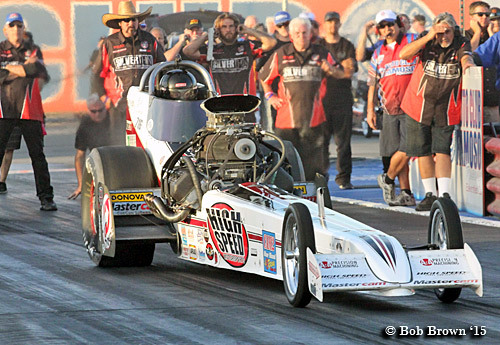 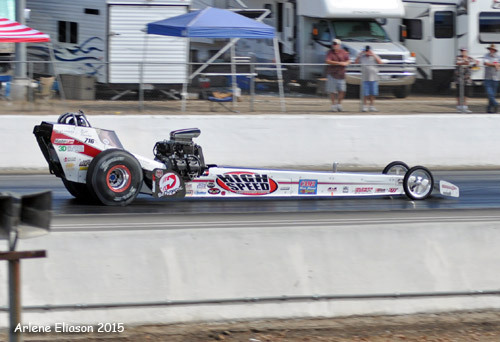 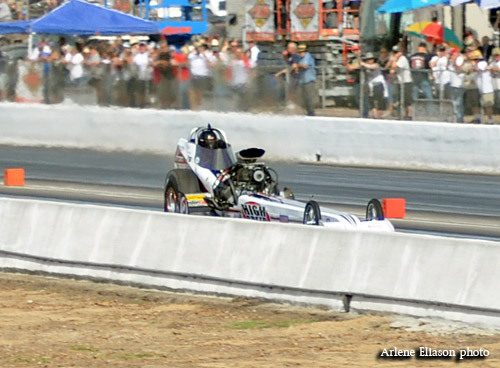 Showing championship form, and in dramatic fashion, 74-year-old Bill Dunlap captured the Top Fuel Eliminator title in the High Speed Motorsports entry at the 24th California Hot Rod Reunion. 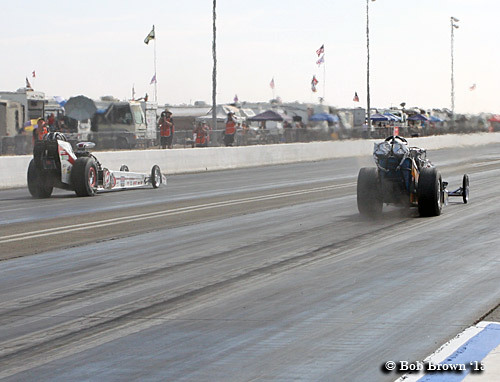 With the exception of a single in round 3, Dunlap faced stiff competition resulting in close races. 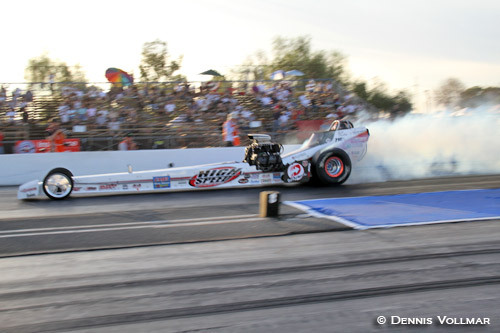 Carding a stellar 5.695 at 255.58 "Great White" nosed out Denver Schutz's 5.838 at 255.58 (who beat Bartone in the semis) in the final. 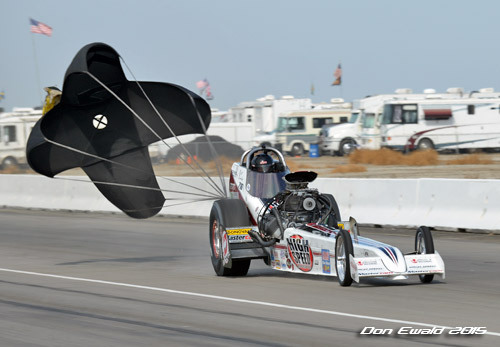 Dunlap defeated Brendan Murray, Dave Hirata, and Rick White to advance to the finals. 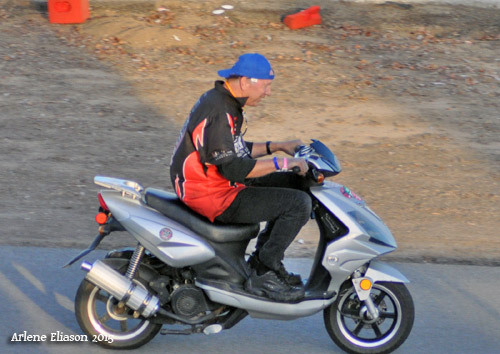 *There are A LOT of photos in this coverage because: (1) There were 6 people shooting and I want them all represented. 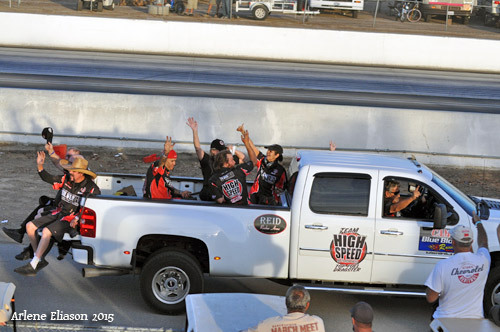 (2) This was arguably the biggest win in the teams long history. 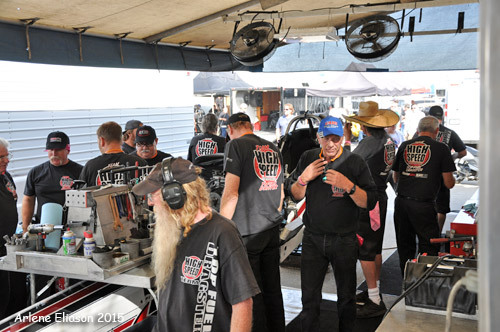 (3) The team really deserves the recognition. 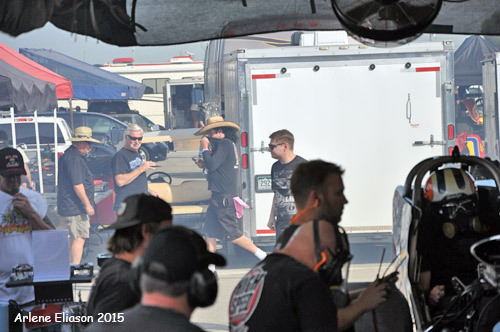 So fans, on behalf of High Speed Motorsports, we hope you enjoy this in depth coverage. 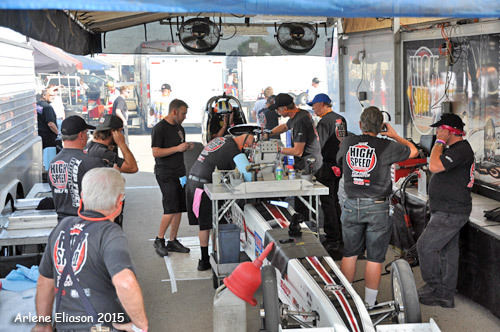 Friday morning was bright and sunny, and we'll open with some pit shots as the team readied for the first of three qualifying sessions. 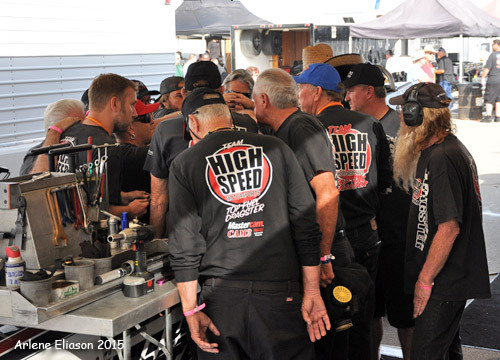 There is always a team pep talk at the start of the day. 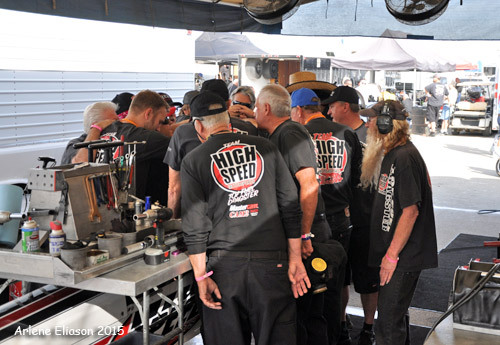 Before every qualifying run and race the engine is warmed up for several reasons including checking the timing and make sure there are no leaks. 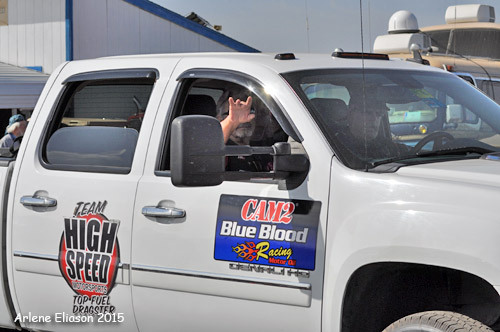 Rolling out for the first session. 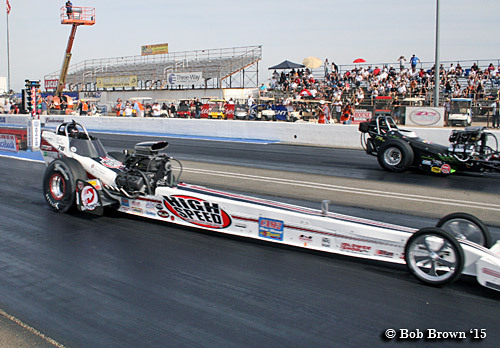 For his first shot at one of the best drag strips in the country, Dunlap was paired with Brendan Murry in his "Running Wild Racing" fueler sporting a late model hemi. 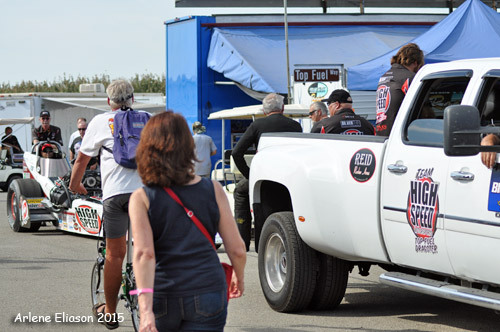 Towing to the staging lanes. 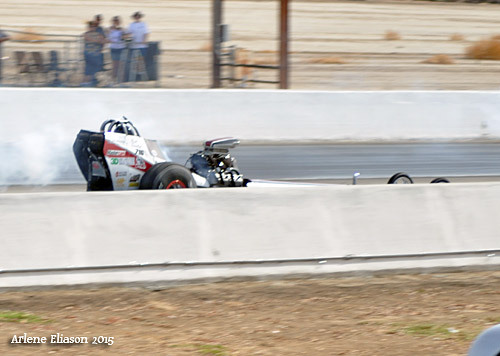 For the late session on Friday Dunlap was paired with Jim Murphy in his WW2 Racing entry. 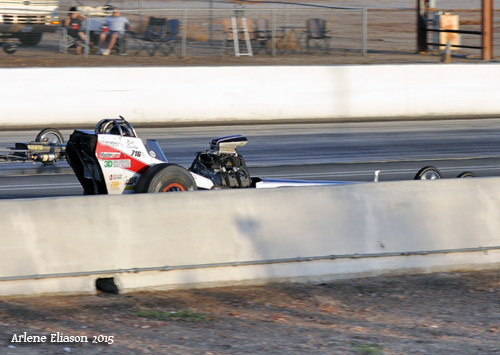 Both drivers had great runs. 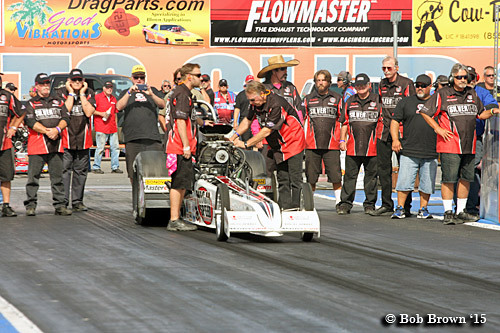 Dunlap with 5.70 at just 232.87, while Murphy ran a 5.75 at just 228.48. 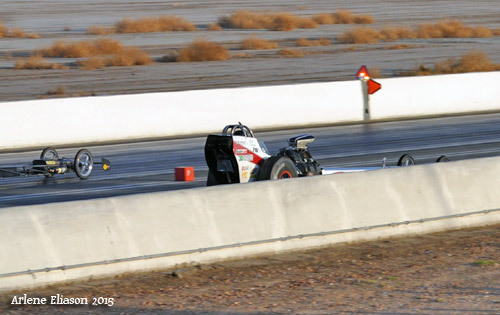 The speeds show neither driver ran it to the lights. 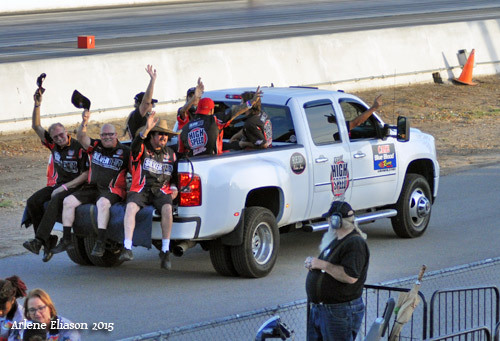 Tom Shelar followed by a happy crew. 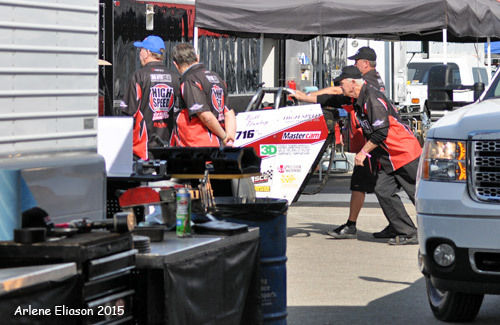 Another beautiful day and for the 3rd and last qualifying session. 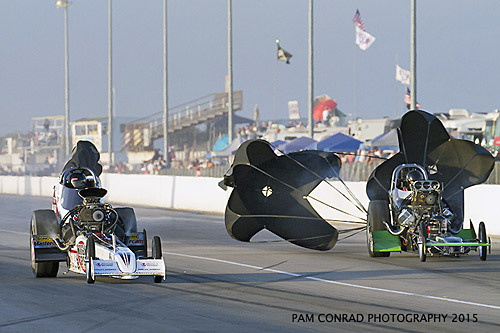 Dunlap found himself paired up with Jim Murphy again, both in the same lane as the late Friday session. 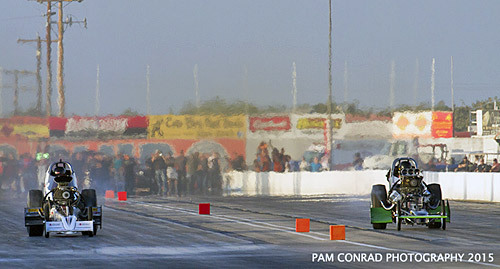 This is weird because you're supposed to swap lanes each session. 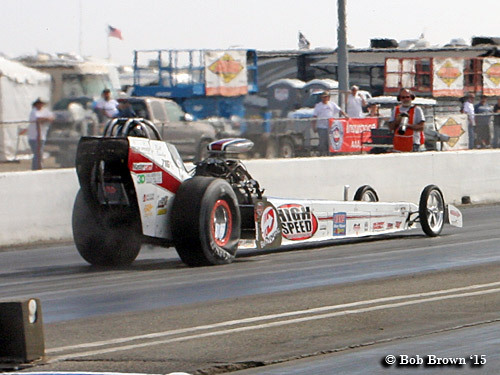 Dunlap hazed the tires just past the 60' light but recovered to finish the run. 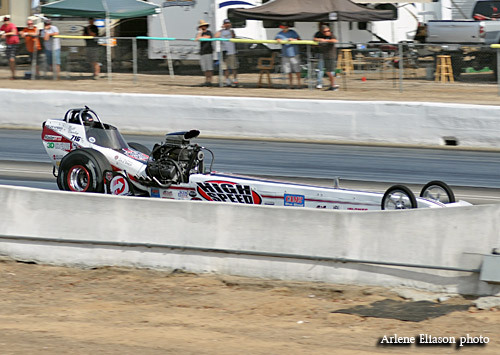 Tuner/owner Tom Shelar tried something new that simply made the car too aggressive. 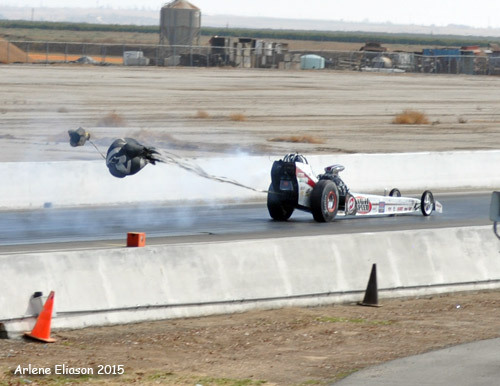 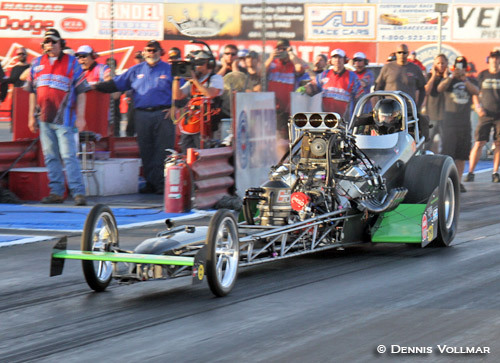 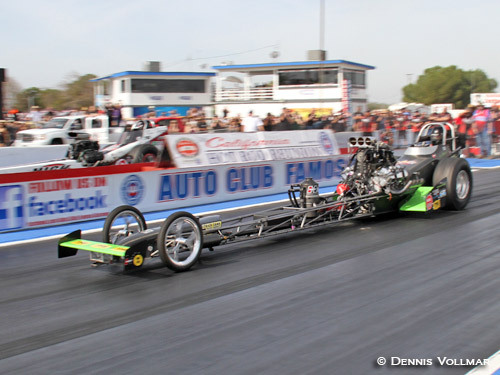 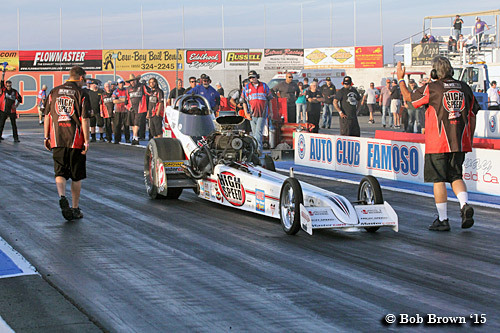 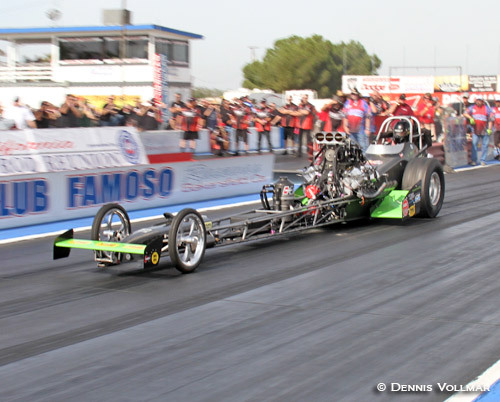 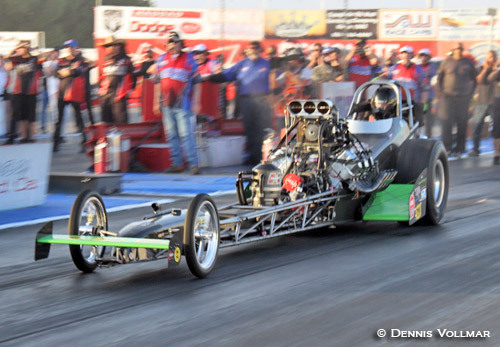 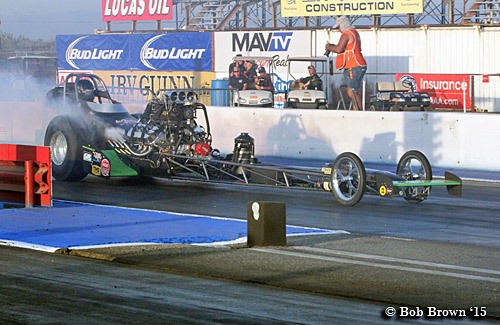 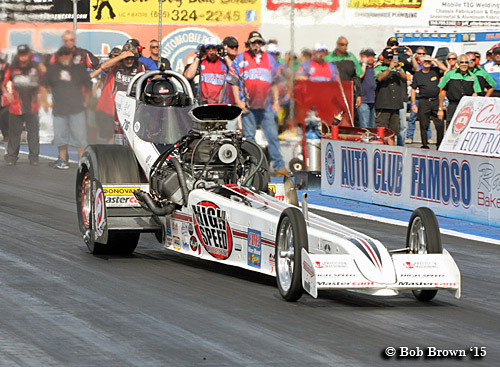 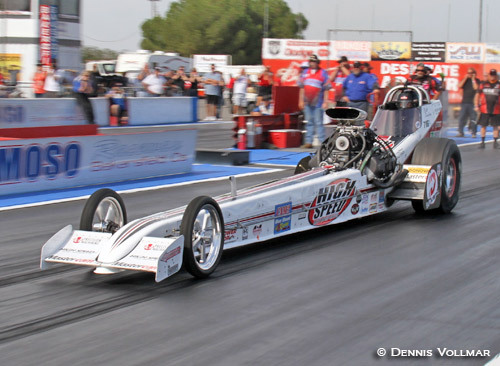 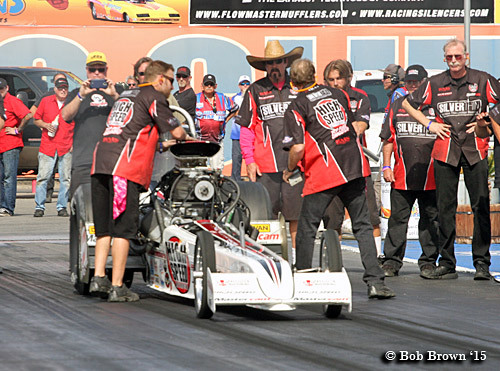 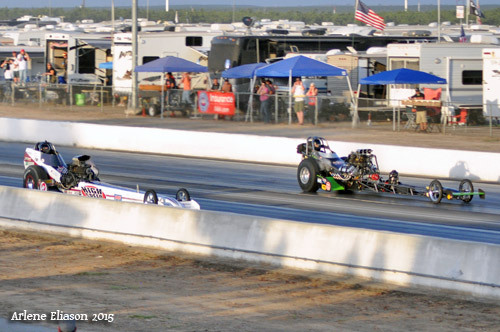 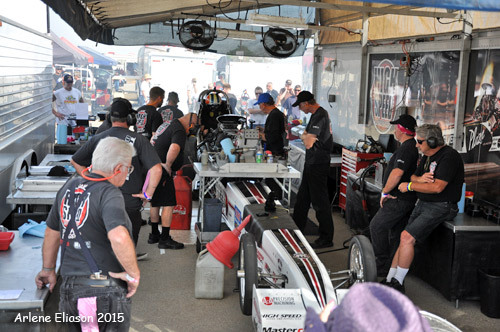 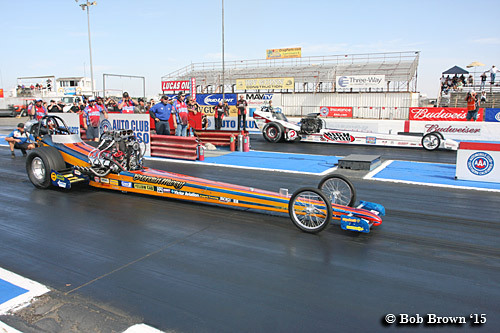 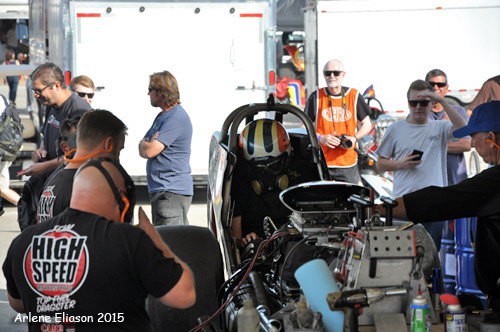 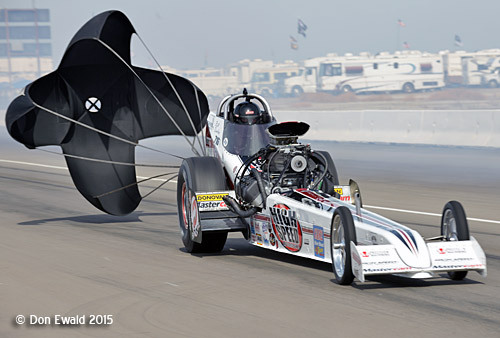 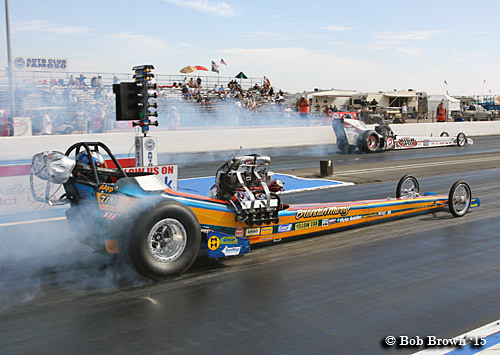 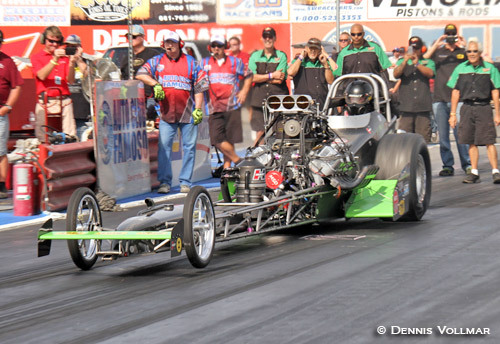 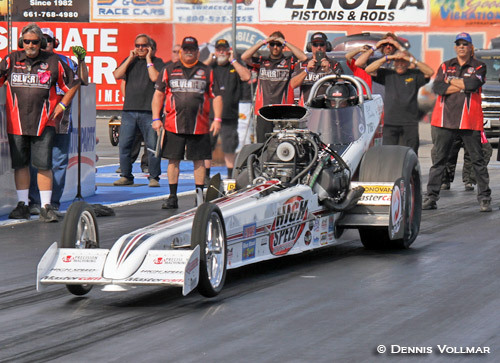 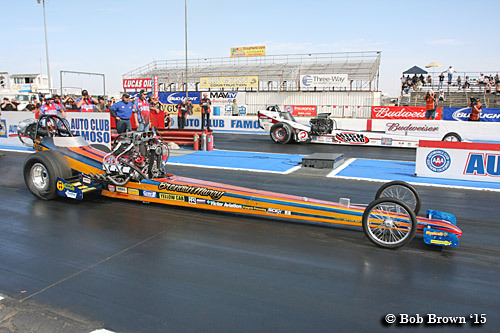 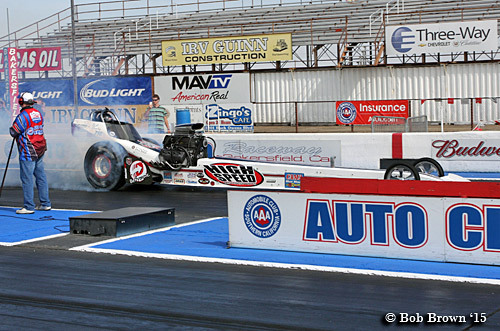 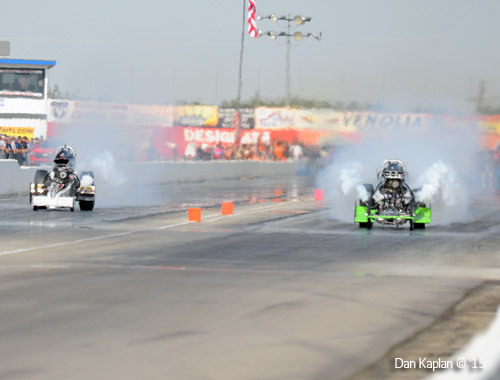 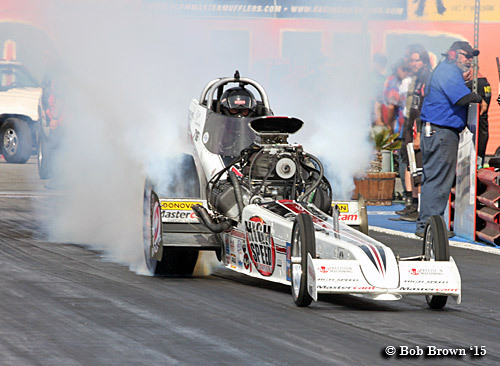 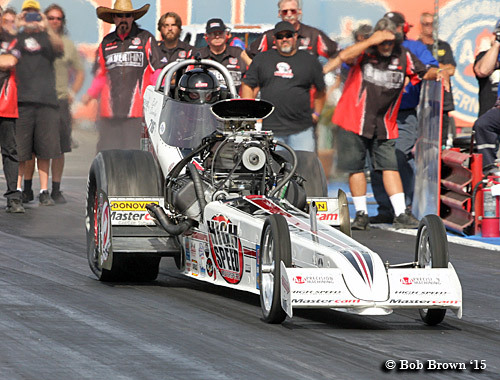 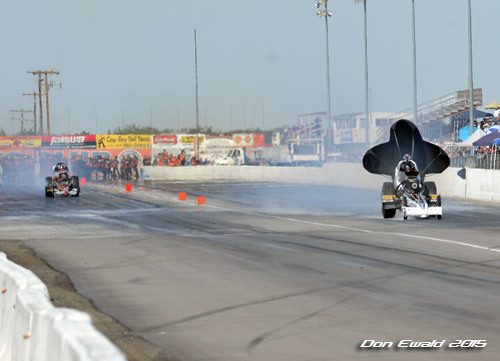 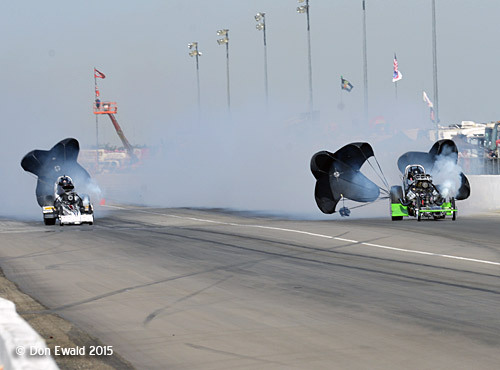 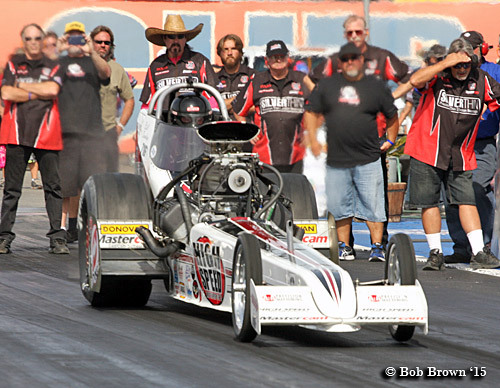 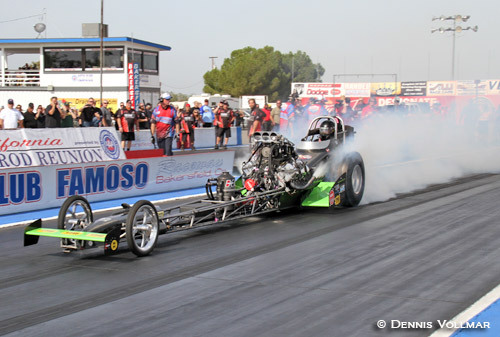 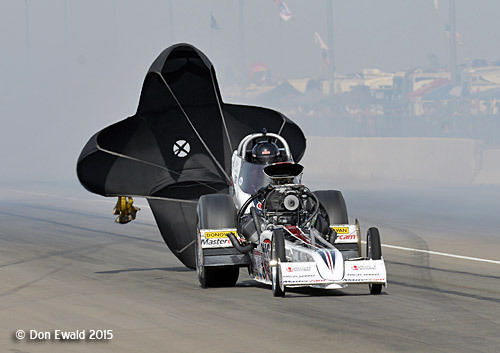 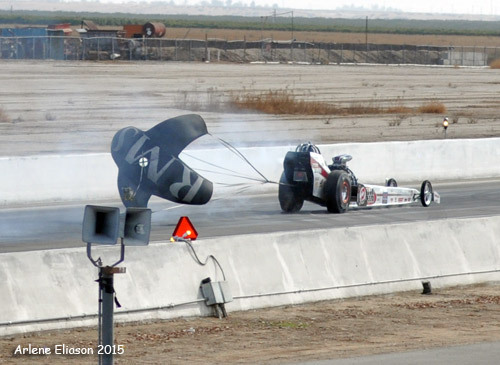 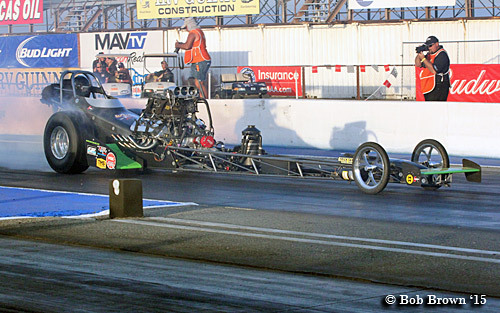 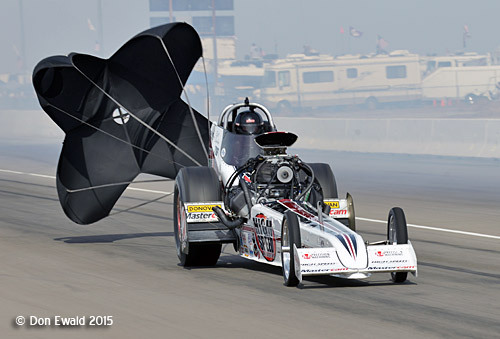 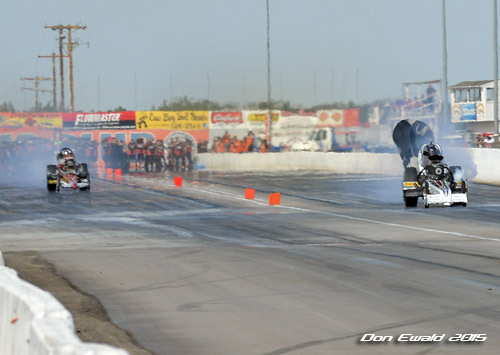 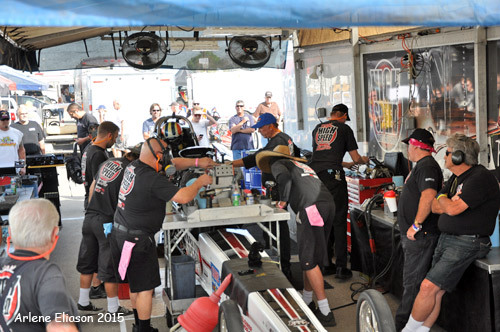 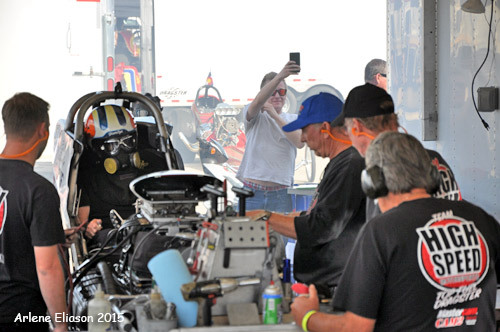 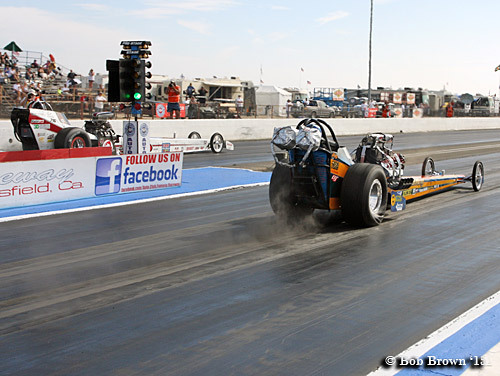 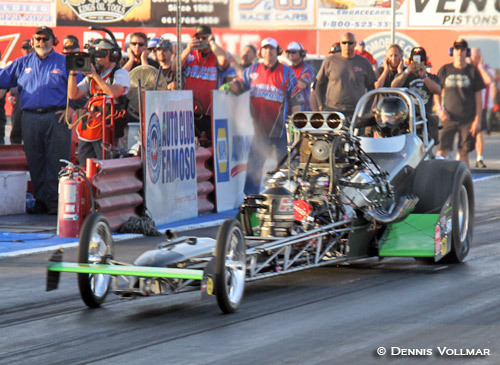 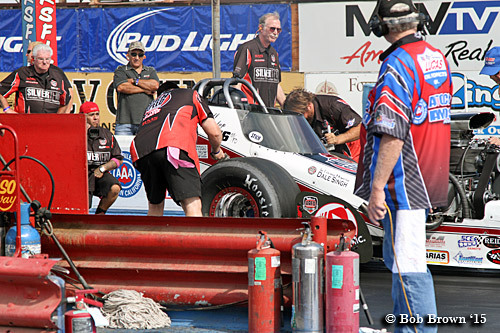 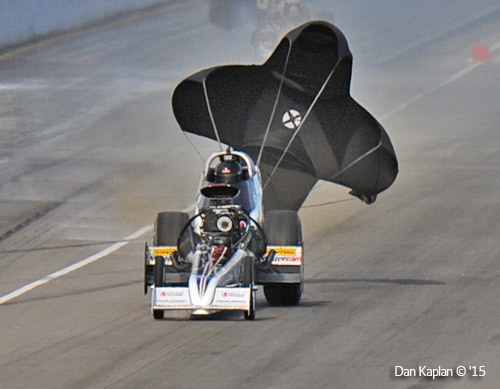 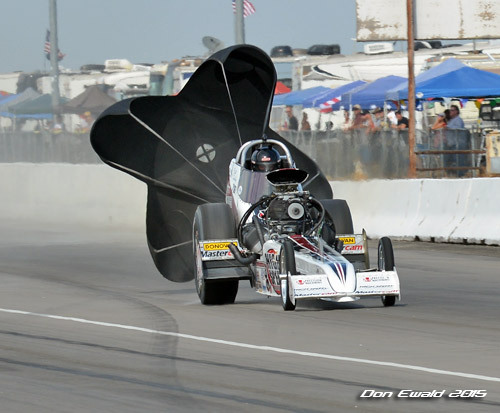 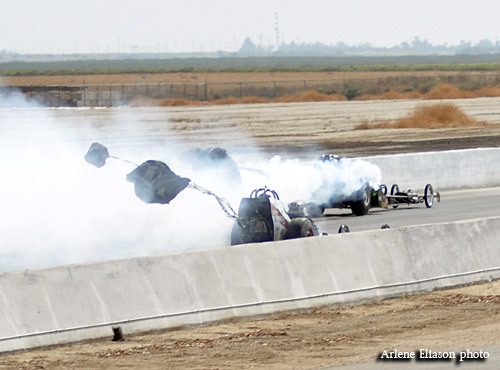 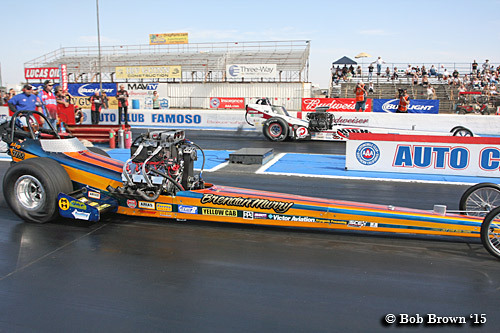 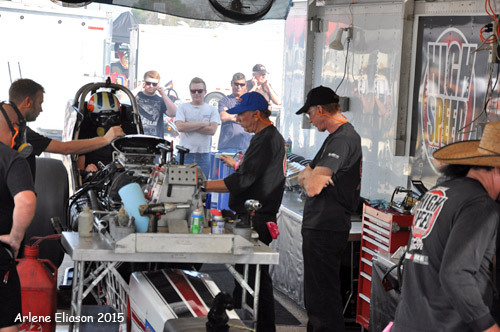 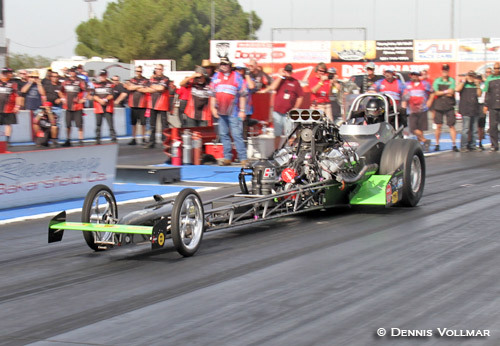 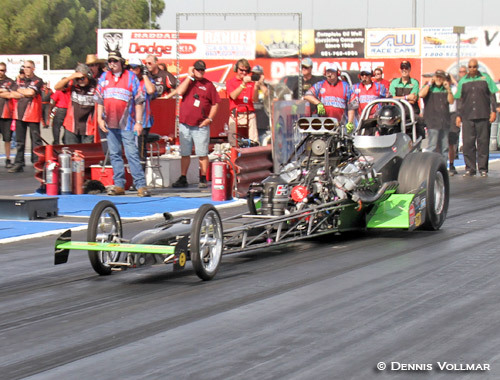 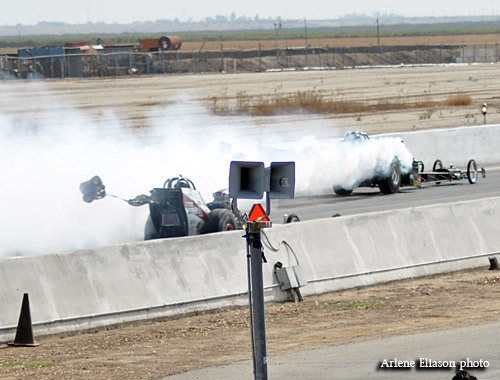 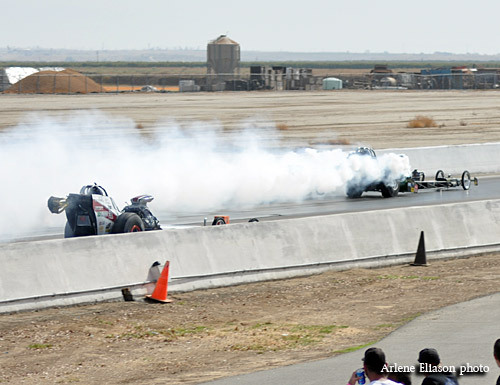 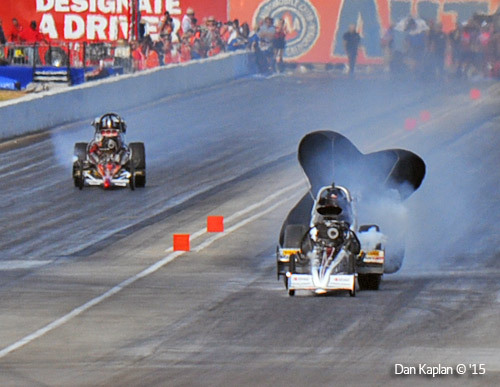 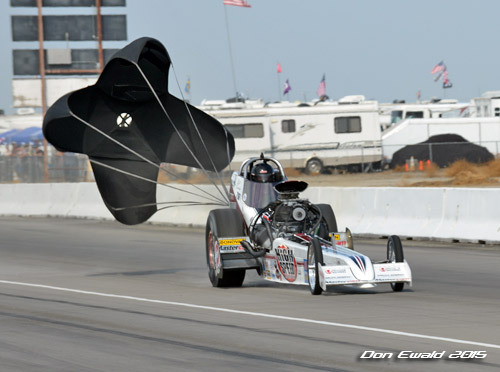 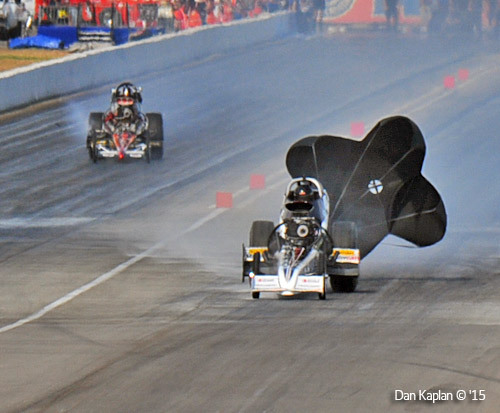 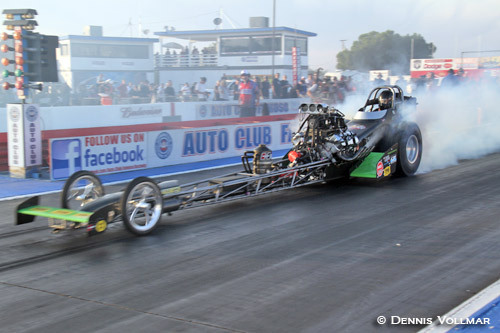 Murphy experienced some burnt pistons carding a 5.74 at 241.01 while Dunlap salvaged a 5.97 at 228.11.